Uncharted 4: A Thief's End isn't the only game starring Nathan Drake coming out this month. 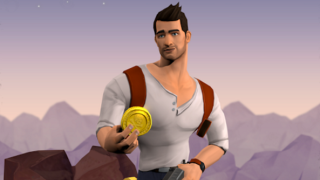 Much like how Bethesda's Fallout 4 had the mobile tie-in Fallout Shelter, Sony's Uncharted 4 is getting Uncharted: Fortune Hunter - a puzzle game for iOS and Android starring the infamous treasure hunter. And playing it could net you some in-game swag when you fire up Uncharted 4's multiplayer. By having the cartoonish Drake collect treasures strewn about Fortune Hunter's 200-plus stylized puzzles, you can earn costumes, boosts, and relics for use in Uncharted 4. Fortune Hunter is free, but (and try to contain your surprise here) features microtransactions. I tried the first few puzzles of Fortune Hunter and it's not bad if you're a fan and need to kill some time. It obviously pulls some influence from Square Enix's Lara Croft GO, which is kind of funny, considering the Tomb Raider reboot has similarities with the Uncharted series, which in turn was inspired by Tomb Raider. The cycle continues.